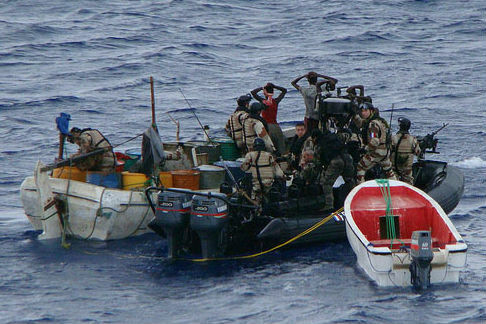 Drawing on a decade of work on maritime security issues in Africa, the Africa Center for Strategic Studies, in consortium with interagency partners, has released the comprehensive Gulf of Guinea Maritime Security and Criminal Justice Primer. The waters surrounding the continent are vast depositories of natural resources. From fisheries to hydrocarbons, these resources generate valuable revenue to littoral African states. In addition, they are a source of food and employment for millions of Africans. The seas also serve to connect African countries to their neighbors and to the rest of the world. To realize the potential of this “blue economy,” African states must effectively deal with significant maritime security challenges including piracy, illegal fishing, illegal migration, arms trafficking, narco-trafficking, and marine pollution. The territorial waters of most Africa states are vulnerable because sovereign control is seldom fully exercised due to inadequate maritime domain awareness and response capacity. The magnitude of the threats will increase unless African governments enhance their security capacity. The adaptive nature of maritime security threats also requires collective security measures. The emerging regional architecture rests on three important pillars: political will, security, and law. A series of meetings, including at the head of state and ministerial levels, focusing on maritime issues over the past few years, are an indication of the importance and sense of urgency that African leaders have assigned to this issue. Africa is also redoubling its efforts—at the continental, sub-regional, and national levels—to develop the cooperative frameworks needed for maritime security. The African Union, the Economic Community of Central African States (ECCAS), and the Economic Community of West African States (ECOWAS) are developing, integrated maritime strategies. At the operational level, the concept of maritime zones allowing groups of states to collaborate in the pursuit of common maritime security interests is a vital innovation in this regard. The Djibouti Code of Conduct and the Yaoundé Code of Conduct are important steps to develop a robust legal framework to support maritime security goals for the continent. The Gulf of Guinea Maritime Security and Criminal Justice Primer captures these multilayered efforts in an integrated handbook that will serve as a reference for policymakers, security practitioners, and scholars focused on strengthening maritime security in Africa.